Hi. So, let’s talk about curves, shall we? And, because I fully intend to hold onto this hip-to-waist ratio, I’ve started to pay extra-special attention to my clothes and how they perform while I’m in the middle of training. Like, for instance, workout tights. Sometimes, they slip, they slide, they ride up, they’re not long enough in the torso, they’re perpetual wedgie givers, they refuse to stay put…. blah to all that. It’s 2014, and the curvy girls need pants that behave while they train. I searched high and low for my dream tights. I ignored the fact that curvy girls apparently don’t model training gear, and – for the sake of this post – you should, too. What matters most is that you consider these tips when making your next purchase, because I’ve got the goods to keep you safe, comfy, and stress free! Note: Some of these links are my personal links for purchase; meaning, if you make a purchase using one of these links, the manufacturer pays me a few pennies for leading you to them! What’s so wrong with sweatpants? For some of us, a baggy pair of sweatpants makes a world of sense – they’re cheap, they come in a multitude of sizes, and thanks to the elastic and the drawstrings, they stay put quite nicely. Buuuuuut, my biggest complaint is how unsafe sweatpants can be during training. The baggy nature of the pant near the ankle area can quickly become a trap where your foot gets caught in the leg part of your other foot, because the baggy fabric combined with the elastic closure can form a balloon trap for your ankles. 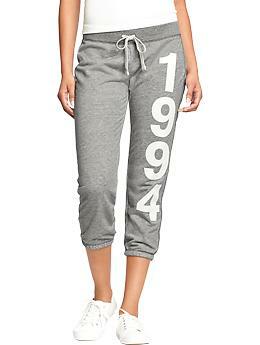 If you can make sweatpants work for your particular activity, go for it. Otherwise, consider wearing a tighter version or smaller size sweatpant, or maybe a jogger/sweatpant capri combo, like these cropped sweatpants available at Old Navy in sizes up to XXL for $19.97 right now. Consider the “tall” version of your ideal pant. Sometimes, a good and reliable drawstring can do wonders to keep your pants up in the middle of high-impact activities like running, plyometrics – you burpees lovers…and everyone loves burpees, right? – and whatever else has got you jumping up in the air (and staying there.) 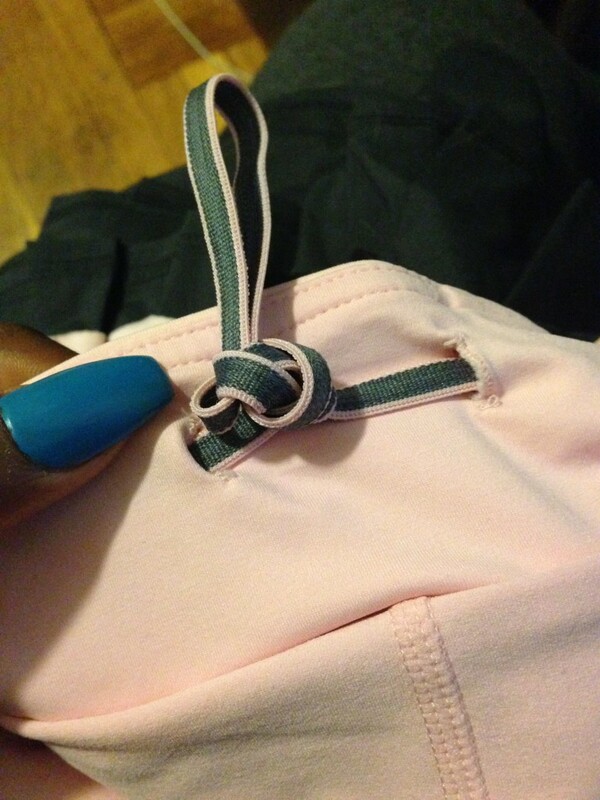 I like the Nike Relay Capris, available at Amazon.com for $55, but my only beef is the actual drawstring – nowadays, most drawstrings in pants come with the actual string connected at the ends, so that it’s more of a loop and less like a shoelace. Also, it’s less likely to get lost up in your darn pants. So, until I find my dream pair of pants, consider tying your drawstring together at the end, and then knotting it like above when you’re ready to tie it to train. High-rise pants are your friend. …like these 3/4-length Performers’ Tights from Adidas, for $45 right now. Check for shorts that are either loose and light, or the kind that have the soft-grip material at the seams to keep them in one place when you’re moving. The worst thing that could happen is your tight shorts roll up, and then have the thickness of the rolled up fabric cause an unpleasant chafing situation. Think bermuda-esque shorts! The kind that stop at your knees? Yes! These Nike Pro Core Compression Studio shorts might be for you, available at nike.com for $40. What tips do you have? What’s your favorite pair of workout pants and why? What did I leave out? Let’s hear it! I love the old navy active line. For us girls with booties, they stay up without the gradual fall. Even if you don’t like compression they carry yoga leggings with either a roll over waist or the flat waist. I like both equally. I am going to check Old Navy’s pants out too. I love the Danskin brand from Walmart: cute, comfortable and inexpensive. I am glad I am not the only one who is running but has to stop to pull the back of her pants up. I didn’t know there were pants that cater to this. Usually once I get sweaty, the pants cling to me and I’m good but it wastes my energy for the first few mins of my workout pulling them up constantly. I am a cheapskate so I will have to look for sales on this stuff. Thanks for the info!! I have found great pairs of tights for less than 24 bucks at stores such as TJ Maxx and Marshall’s. The brand of these pants are MPG and guess what they have a drawstring which is a PLUS PLUS for those of us who are extremely blessed. They have a drawstring and even a little pocket in the back waist area that’s not notice unless you’re paying attention. Each time I’m at the stores I am checking for these pants. I have been wearing Danskin supplex tights since the early 80’s and I haven’t found a pair of leggings that fit better then Danskin. They are not see through so you can wear them anywhere with anything. Have you ever thought of reviewing clothes for hot yoga? I’m always interested in new garments! That draw string is SO helpful. I have a few pairs of compression capris from Old Navy that have one and I stay wearing those for RIPPED class and with my personal trainer (since those are the classes that have me jumping around the most). I need to start checking out the Danksin line again because that’s what I started with when I first started out on this fitness journey, but they don’t fit anymore lol. Love this! About shorts: I say, if you got booty, wear booty shorts. It ‘s a good way to build confidence by not feeling like you’re hiding all the time. Plus, in hot power yoga you want to stay as cool as possible! If you’re not into southern exposure, try the pants made from recycled water bottles. They are super durable and lighter than air!